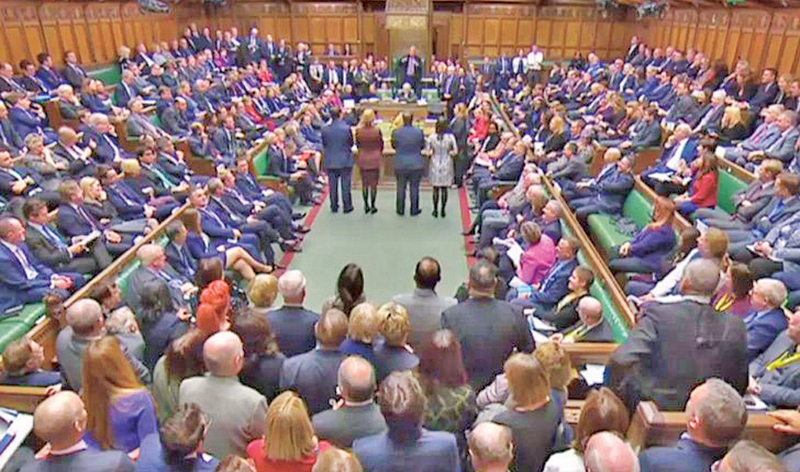 A video grab from footage broadcast by the UK Parliament’s Parliamentary Recording Unit shows MPs in the House of Commons in London on Tuesday. UK: Britain’s Government suffered a stinging rebuke from MPs ahead of Tuesday’s momentous Brexit debate, exposing Prime Minister Theresa May’s lack of support in parliament. The House of Commons voted 311-293 to censure the government for failing to publish its full legal advice about the divorce deal May struck last month with the European Union. The outcome forced May’s team to promise to release the full tome ahead of next Tuesday’s vote on the contentious Brexit agreement. “This house has now spoken and it’s of huge constitutional and political signficance,” said opposition Labour Party member Keir Starmer. The rebuke underscores the struggles May faces as she tries to keep Britain from crashing out of the world’s largest single market in March without any firm trade arrangements. The government suffered another blow just one hour later when parliament also voted in favour of an amendment that will give greater decision-making powers to MPs if, as expected, May’s deal is voted down next week. May was set to kick off five days of debates later on Tuesday by saying her vision of a future apart from the other 27 EU member states reflected the wishes of voters. “The British people want us to get on with a deal that honours the referendum and allows us to come together again as a country, whichever way we voted,” May was due to say. But that message of unity suffered a setback from Tuesday’s parliamentary vote. Downing Street argued that May’s government had a right to receive confidential opinions that were unhampered by political considerations. “The government is upholding an important point of principle,” the prime minister’s spokesman said. Yet the text’s full publication is unlikely to impact a Brexit deal vote that faces resistance from all sides of a bickering House of Commons. Pro-European MPs pressing for a second referendum on staying in the EU received a sudden boost from an opinion issued by a legal adviser to the European Court of Justice (ECJ). Advocate General Campos Sanchez-Bordona stated that Britain could halt the entire process without the agreement of other EU countries. “That possibility continues to exist until the withdrawal agreement is formally concluded,” he said. Downing Street reaffirmed on Tuesday that May has absolutely no intention of doing so -- and that the ruling was in either case only advisory. “It does nothing, in any event, to change the clear position of the government that Article 50 is not going to be revoked,” May’s spokesman said. The vote next week has huge implications for Britain’s future and that of May herself. Left-wing Labour said May’s defeat next Tuesday would likely trigger a confidence vote to bring down her government. She has also been constantly challenged by hardline eurosceptics in her own party and might face an internal leadership contest as well. Hardline Conservative Brexiteers say May’s compromise deal does not represent enough of a break with Brussels.